This claims to be a blog about music and family life, but I’ve noticed in recent weeks I’ve spent precious little time on either. So, here’s a quick Aidan and Kieran update. Aidan has become a voracious reader. In the past couple of weeks he’s started sounding out lots of words, and he really enjoys sitting down with books and reading to Kieran and me. We already have plans to get him ready for the Scripps National Spelling Bee in 2014. He’s struggling with ‘epidemiology’, but I know he’ll get it soon. In the past week, Aidan has also had three timeouts for hitting other children. We’re kind of surprised at this development, as he hasn’t really exhibited much aggressive behaviour at home. I’m starting to think it wasn’t the best parenting decision to let him watch WWE’s Survivor Series pay per view, but he really really really wanted to see Batista take on the Undertaker in the Hell in a Cell match. If he tries to chokeslam someone on the playground this week, then I’ll know who to blame. Aidan came home with his class photos last week, and he looks really cute. I won’t post the pics here as some of you may get one for Christmas and I don’t want to spoil the surprise. 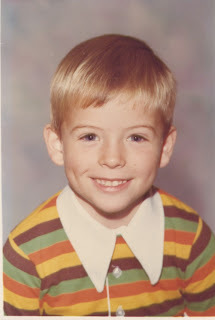 I can tell you that he looks remarkably like the adorable kid in the photo below. 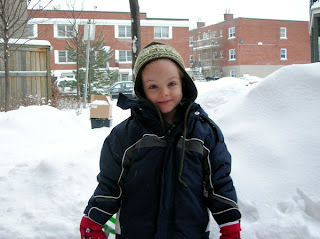 O.K., here’s the real Aidan helping me dig out of this week’s blizzard. Check out our three-foot tall snowbank. Cute! Look at the collar on your shirt. Straight out of the 1977 JC Penney catalogue, I bet.